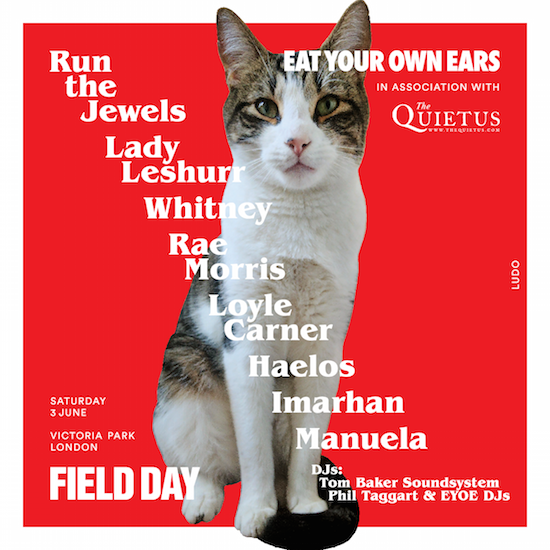 Details of Field Day's main stage, presented by promoters Eat Your Own Ears alongside us here at tQ, for this year's event have been announced in full with Run The Jewels topping the bill. Also set to play the stage across the day on June 3 are Lady Leshurr, Whitney, Rae Morris, Loyle Carner, Haelos, Imarhan and Manuela. This year's Field Day takes place on just one day and will see the addition of a new indoor arena which will feature headline performances from Aphex Twin and Nina Kraviz, plus a number of other DJs playing across the day. Also set to play the festival are Slowdive, Arab Strap, Lena Willikens, Flying Lotus, ABRA, Gaika, Kaitlyn Aurelia Smith and lots more. For the full lineup and to get tickets, head here.